This is a major step in advancing the translation of basic science to clinical applications, with implications for aging R&D. If we want to save more lives and keep this country the leader in medical innovation, we have to make sure there’s not a major gap between the science of cures and the way we regulate these therapies.
. . . for the first time ever, we in Congress have taken a comprehensive look at what steps we can take to accelerate the pace of cures in America. We have looked at the full arc of this process – from the discovery of clues in basic science, to streamlining the drug and device development process, to unleashing the power of digital medicine and social media at the treatment delivery phase. The committee is seeking input on this bold new initiative from a wide variety of interested stakeholders. Engage on social media by liking us on Facebook, Following us on Twitter, and using the hashtags #Path2Cures and #Cures2015. 21st Century Cures is a truly collaborative effort. Please be advised that submissions sent to cures@mail.house.gov will be made publicly available on energycommerce.house.gov/cures as part of the effort to encourage continued discussion about opportunities and ideas to accelerate the pace of cures. We thank you for participating. Newsletter subscription is not required. Will you support the creation of aging solutions by buying them on Amazon? Office supplies, Tools and lots more. Search Amazon for whatever you need. GO TO THIS PAGE FIRST, then click the link to Amazon. An advance toward aging interventions. The CRISPR/Cas9 system makes it possible to easily and inexpensively edit genetic information in virtually any organism. T cells, which circulate in the blood, are an obvious candidate for medical applications of the technology, as these cells not only stand at the center of many disease processes, but could be easily gathered from patients, edited with CRISPR/Cas9, then returned to the body to exert therapeutic effects. A protein on the T-cell surface called CXCR4 was disabled. CXCR4 can be exploited by HIV. The group successfully shut down PD-1, a protein that has attracted intense interest in the burgeoning field of cancer immunotherapy, as scientists have shown that using drugs to block PD-1 coaxes T cells to attack tumors. Alexander Marson, PhD, a UCSF Sandler Fellow says it’s difficult, and the group is driving as hard as they can toward applications. The new work was done under the auspices of the Innovative Genomics Initiative (IGI), a joint UC Berkeley-UCSF program co-directed by Berkeley’s Jennifer Doudna, PhD, and Jonathan Weissman PhD. More details about the program, IGI, supporters and UCSF follow. AncestryHealth, whose first offering is a tool to track hereditary disease. The aim of the research is to be able eventually to identify signs of premature aging before it becomes evident years or decades later in chronic diseases such as cardiovascular disease, diabetes or kidney and lung impairment. 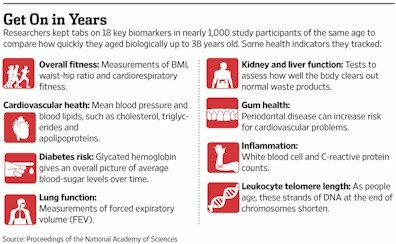 “Intervention to reverse or delay the march toward age-related diseases must be scheduled while people are still young,” according to the study, published online last week in the Proceedings of the National Academy of Sciences. “pace of biological aging” is defined as the declining integrity of multiple organ systems. Belsky said the research team also hopes to investigate differences in how fast people age by looking at genetics, lifelong environmental factors and lifestyle behaviors. The global population is aging, driving up age-related disease morbidity. Antiaging interventions are needed to reduce the burden of disease and protect population productivity. Young people are the most attractive targets for therapies to extend healthspan (because it is still possible to prevent disease in the young). However, there is skepticism about whether aging processes can be detected in young adults who do not yet have chronic diseases. Our findings indicate that aging processes can be quantified in people still young enough for prevention of age-related disease, opening a new door for antiaging therapies. The science of healthspan extension may be focused on the wrong end of the lifespan; rather than only studying old humans, geroscience should also study the young. Werner syndrome is caused by a mutation to the RecQ helicase-like gene (WRN) which generates the WRN protein. Normal form of the protein is an enzyme that maintains DNA structure and integrity. Mutated Werner syndrome protein disrupts replication and repair of DNA and the expression of genes, which was thought to cause premature aging. Resulting cells mimicked the genetic mutation seen in actual Werner syndrome patients, so the cells began to age more rapidly than normal. Deletion of the WRN gene also led to disruptions to the structure of heterochromatin, the tightly packed DNA found in a cell’s nucleus. Researchers showed that the protein interacts directly with molecular structures known to stabilize heterochromatin–revealing a kind of smoking gun that, for the first time, directly links mutated WRN protein to heterochromatin destabilization. Izpisua Belmonte added that more extensive studies will be needed, including how it interacts with other cellular processes implicated in aging, such as telomere shortening. Belmonte team is developing epigenetic editing technologies to reverse epigenetic alterations with a role in human aging and disease. That disorganization of heterochromatin is a downstream process. Think that the helicase is either down-regulated with age or miRNAs against it are up-regulated or both or some other life-stage-dependent mechanism prevents chromatin repair and remodeling. So in the case of Werner’s syndrome, the helicase gene is constitutionally lost or impaired at age zero, in non-Werner’s folks (us), it becomes reduced in effect with age, thus allowing a longer lifespan. But it is one of many aging clocks I believe, the telomeres are another, mitochondrial dysfunction…. So the question is, since we know that genes are not randomly activate/inactivated at different life-stages (as opposed to the ‘wear and tear’ers who believe that randomly inactivated essential genes for repair and maintenance produces aging (while no other genes are apparently ‘randomly’ inactivated), that position sounds so dubious as to make me feel embarrassed for the majority of scientists in aging research), the question is what inactivated those repair and maintenance genes? Is it a cell-intrinsic process or is it signalling from body to cell? I’d bet on the latter.